Have you ever wanted an easy and visually appealing way to combine all of your recipes, both from the internet or your favorite family recipes? Do you want an easy way to make weekly meal plans or grocery lists? Are you a beginner cook like me and need something simple and useful? Introducing Pepperplate! This app is available for iPhones and Androids, including the Kindle Fire (which is what I use it on.) 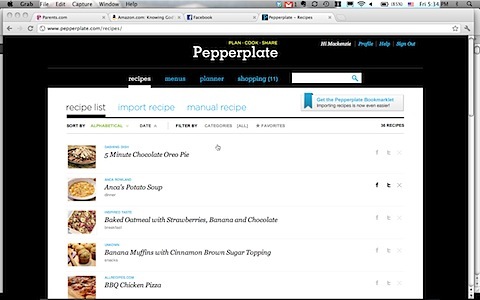 Pepperplate is a recipe organizer, as well as generating meal plans, menus, and shopping lists. Seriously, this app saves me so much time while I'm cooking and gives me a ton of space to cook as well. It's free, but it really shouldn't be because it's so amazing. It's really user-friendly and using it on your iPhone, iPad, or Kindle would save a lot of room in the kitchen. 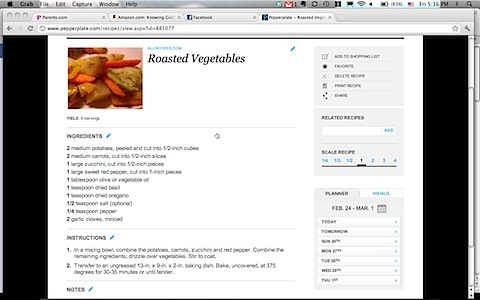 You input the recipes on your computer, and then they automatically download to your phone or tablet. When you want to cook, you can just set your phone or tablet on the counter, which takes up a lot less space than a cookbook or computer. There is also a timer on the recipe page for cooking. When you want to go grocery shopping either print the list, or just open the app on your phone/tablet for easy access to your shopping list. You can easily enter in your own recipes, but there is also a bookmarklet (like the "Pin It" for Pinterest) for well known recipe websites like Taste of Home, All Recipes, Chow, and Food.com. The recipe page gives the link to the original recipe site, the ingredients, instructions, and helpful notes. 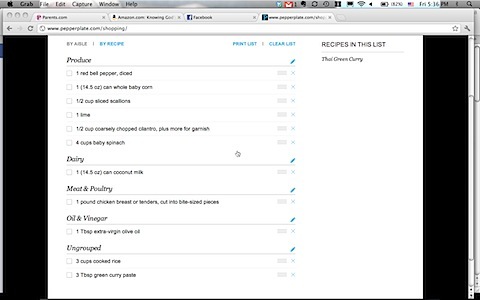 You can also add the recipes to a weekly meal planner, to a shopping list, or to a custom menu. This breaks the shopping list into types of foods, or by aisle. So helpful!